Nisportino Domus is at Nisportino, in the municipal area of Rio nell'Elba, on the northern side of the island of Elba. On leaving the ferry, follow signs for Rio nell'Elba. Once at Rio nell'Elba, continue towards Nisportino (about 15 minutes by car). 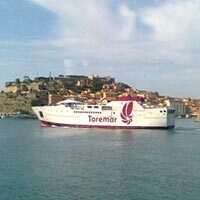 On leaving the ferry, follow signs for Rio Marina, once at Rio Marina continue to Rio nell'Elba. Once at Rio nell'Elba, continue towards Nisportino (about 25 minutes by car). On leaving the ferry, follow signs for Porto Azzurro, drive through Porto Azzurro and continue to Rio nell'Elba; from there, continue towards Nisportino (about 40 minutes by car). Once at Nisportino, turn uphill to the right (signed as no through road) and you will come to the Domus Resort entrance after 200 metres. Arriving by plane: by plane to Campo nell'Elba and then, by hire car or taxi, take the road to Porto Azzurro, then to Rio nell'Elba and on to Nisportino.